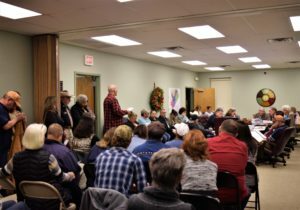 The questions did not go away nor did the tension in the room dissipate when the CWSC Board retired into executive session at 6:42 p.m. In part two of this series, the immediate aftermath of the closed door session was examined. In part three, the questions which were initially raised were re-addressed by shareholders Kevin Holbrook, Kirk Brenner and Kim Spellman. 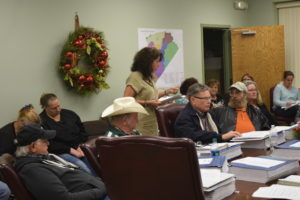 The trio had previously spoke before the board during the November meetin g and had leveled allegations of nepotism, preferential treatment, conflicts of interest, excessive overtime and discrepancies in the corporations contributions to the employee retirement plan. Holbrook, a local businessman, spoke first about what he described as mismanagement and billing issues. 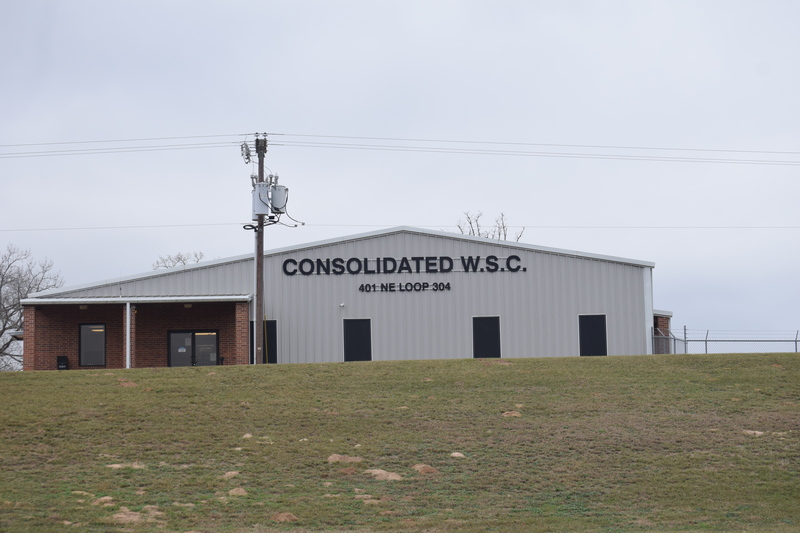 He asked CWSC Manger if the overtime previously mentioned was attributable to CWSC workers at the corporation’s water plants. Reed replied that yes, a fairly sizable portion of the OT was paid to the plant men. Holbrook produced a document pulled from the CWSC financial audit which showed three workers were paid 44 percent of all OT wages in 2014, 37 percent of the OT in 2015 and the projected 2016 number was 34 percent. The total of all OT wages paid in 2014 was $145,958.21 of which the three employees referenced above received $60,677.62. The total of all OT wages paid in 2015 was $195,063.47 of which the three employees referenced above received $$69,069.88. The projected total of all OT wages to be paid in 2016 is estimated to be 164,253.64 of which the three employees referenced above are expected to receive $54,709.93. Holbrook further added these three CWSC employees were members of Reed’s immediate family. After voicing complaints about billing issues, Board President John Massengill informed Holbrook the issues he raised would be looked into further. The next person to speak was accountant Kirk Brenner. 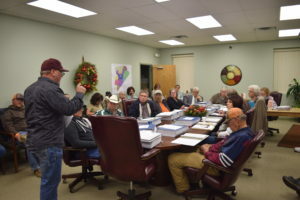 He said while he was aware the questions he had asked about the CWSC retirement plan would not be answered at this meeting, he had further questions. “I kind of interpolated the o verfunding of the retirement plan would have been somewhere in the $394,000 range. When I looked through the minutes of the Dec. 8 (2015) meeting, there was a mention of the retirement plan once again,” he said. “I would like to know what that claim is about. Was it paid? What was the reason for filing a claim with the insurance company regarding the retirement plan?” Brenner asked. 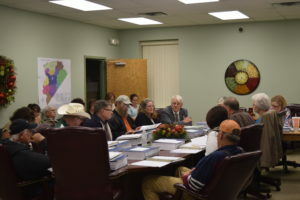 After he was informed a response would be given at the next meeting, Brenner said he never received some of the information he requested in regard to the retirement plan. CWSC attorney Patrick Lindner commented the plan was to have responses drafted for approval by the CWSC Board and provide them to shareholders during the January meeting. What are the elements of the retirement plan? What are the matching limits? What is the change to the plan and was it approved by this board? If so, when and where is the documentation? Why was an insurance claim filed? What is the status of that claim? Has the provider offered any settlement conditions? “The last question I have is this and I would like an answer on this one as well. What are the specific processes that have been instituted based on member feedback whether it is harassment, operational standards or misalignment of pricing practices?” Spellman questioned. Because the possibility of a forensic audit was not on the board’s agenda, a motion to that affect coukd not be made. However, a board member did request an item pertaining to a forensic audit be placed on the January 2017 meeting agenda. After Spellman concluded, CWSC shareholder Davis Nobel spoke to the board. “The dissension heard throughout the town has existed for several years. I believe all of you are aware of it. I came to last month’s meeting because I had questions I didn’t know the answers to. I didn’t hear the answers at the local coffee shop or at Walmart,” Nobel said. He added he was very surprised at the allegations brought forward during the November meeting of the CWSC board and also very disappointed. “What I was so disappointed in was when those questions and allegations were brought up, there were few or any questions and very little discussion on the matter by the board or anyone else. That disappointed me. To be honest with you, there was more discussion about the Christmas party than there was about the mismanagement,” he said. Once that had been accomplished, Nobel requested the board to make the best decision for the best interest of its shareholders and not just a select few.